On a wintry March Saturday, the twin peaks of the Rocky Mountains rugby stood athwart each other to battle for supremacy of Colorado. The unbeaten, defending champion Glendale Raptors hosted their nemeses and winners of two out of their last three, the Denver Barbarians. Despite scoring difficulties by both sides out of the gate, Glendale were able to gradually inch their halftime lead up to a dozen before the teams warmed up in the second stanza. The Barbos fought tenaciously to briefly take the lead, but the Raptors answered the bell, and were able to pull away late via a brace of tries from inside center Justin Pauga sandwiched around captain Zach Fenoglio’s try, 35-17. With no California teams to bring warm weather with them to Infinity Park, the temperatures dipped into the mid-30’s at kickoff. With gusting winds, the kicking game was sure to factor, and the opening stretch of play saw both teams miss penalty kicks that they usually make look routine. Glendale’s aggressive open-field play helped to offset the poor-kicking conditions as they opted to forego a clearance kick inside of their own 22m line. The gambit paid dividends, due in large part to a long break by outside center Martin Knoetze, who zigged across most of the pitch, before the ball was spun wide to speedy winger Dustin Croy for the unconverted try 11 minutes into the match, 5-0. Stalwart defending, led by captain Logan Collins, enabled the Barbos to keep the Raptors from adding more points. Flyhalf Maximo de Achaval negated much of Glendale’s hard fought territorial gains with his prodigious boot, often extricating Denver out of the shadows of their own goalposts. Despite handling difficulties, the Raptors were able to sustain enough pressure to finally break through, as Knoetze, who did much of the work to get them near the tryline, took the ball a few meters out and was able to dive between defenders and score. flyhalf Armandt Peens made his first kick of the match in what would be a rough day for all kickers on the pitch, Glendale went into the break with a twelve point cushion, 12-0. The Barbos opened the second half with more urgency from the backs as speed merchant Kevon Williams slipped through the defense for 50m. With the Raptors scrambling, Denver went to their scoring machine, outside center Michael Al-Jiboori, who patiently waited for the defense to key on him before sending winger Celester Asuega, who fought off the last would-be tackler for the corner try. De Achaval’s conversion attempt bounced off of the post before hitting the icicle-crusted crossbar, but the Barbos had gotten within a try just 4 minutes after halftime, 5-12. Peens slotted a Penalty Kick to return to a double-digit advantage. De Achaval attempted his own penalty kick in retaliation only to be denied by the clanging post once again. However, the ensuing fracas ended in a Denver scrum 10m out. A brilliant 8-man pickup by 7’s Eagle Ben Pinkelman ended in de Achaval scoring both the try and the conversion to cut the Glendale lead to three, 12-15 less than 15 minutes into the second half. The man they call Pink was seeing green as he made a break near midfield, shrugging off tacklers before offloading to a streaking Williams for the try and the lead, 17-15 with 21 minutes remaining. With all of the momentum seemingly with Denver, the Raptors pressed their attack, and with the Barbos wary of Glendale’s dangerous backline, Peens knocked a drop goal through the uprights to retake the lead, 18-17. 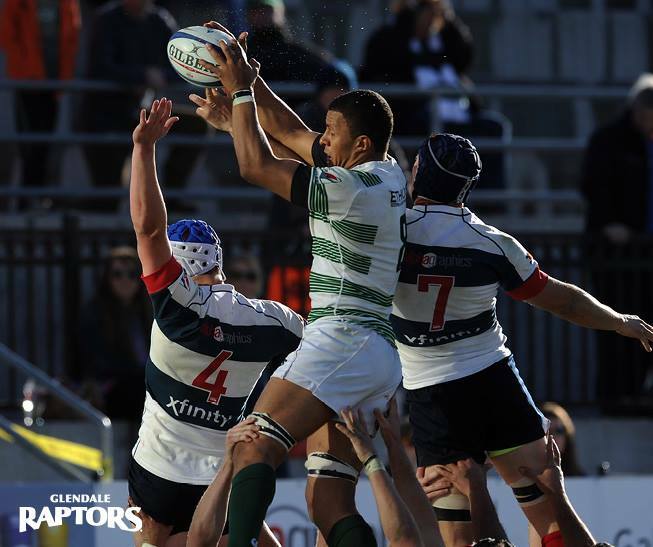 Earning a lineout deep in Denver territory via penalty, the Raptors quickly found the Samoan Bulldozer, and Pauga bounced off of multiple tackle attempts on his way to the try zone, 23-17 in the 66th minute. The Barbos were unable to clear a deep kick out of their own territory, and Glendale pounced on the opportunity. Garnering a penalty 5m out, the Raptors went quickly and used some nifty inside ball to set up Fenoglio for the try. Peens added the extras to give Glendale their biggest lead since the first half, 30-17 with only 10 minutes left. Pauga was able to earn his brace and set the final score with a corner try before the whistle, 35-17 Glendale. Glendale looks to remain unbeaten next week as they host Olympic Club, and the Barbarians will attempt to bounce back and exact some manner of revenge on OMBAC for an opening-week thumping in San Diego.